The lyric suggests that wisdom and education do not go together. It is true that the song is talking about a preacher being an educated fool if all she or he has to offer is book learning and nothing in the way of practical wisdom. While it is difficult to argue with practical wisdom, we all want to know what will succeed in making us happy and help us have a productive and contented life, it is not necessarily the case that practical wisdom and book learning share no common ground. 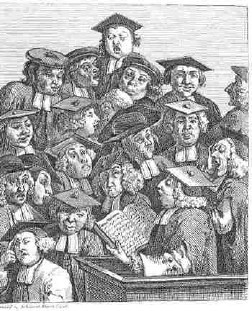 William Hogarth’s engraving captures the common perception of the well educated. There is a group of scholars listening to another scholar giving a lecture. Some are talking while the lecturer is speaking; others are yawning and drifting off to sleep, while the remainder stare somewhat blankly at the speaker. A few are paying real attention, but very few. The implication is that what the lecturer has to say is of little value to anyone and even his colleagues do not take him seriously. As a classroom teacher I recognize this scene, it is frequently acted out in my classroom. I wonder where the problem is in fact, is it with the lecturer or with the audience? It is probably with both. No two people have identical interests and even those that share many of the scholar’s interests are going to find some less than compelling and as a result there will be times when the minds of like minded colleagues will wander. This is often further complicated in the classrooms by students that lack the life experience necessary to understand fully what is and is not of value in the curriculum they are being encouraged to master. Add to this that most of the students in any of my classes, even the most advanced classes, are going to pursue careers unrelated to what I teach. This is not because English is less important than math or science but because statistically the academic interests of my students are spread somewhat equally across the academic disciplines of which English is only one of five or six. It is important that those with a scientific bent are exposed to poetry and the arts, not because this will produce better scientists but because there is more to life than science and our lives are richer if they are not confined to a narrow band of interests. Of course it is also important that scientist write clearly and articulately about what they have discovered. I am not sure that Darwin and Freud understood most deeply and completely the sciences they helped to establish but only that they could write more persuasively than others about what they found. I think this reflects a view of education that is prevalent today, that it is a nice thing to have, but in the end is not that important. We have embraced an egalitarian view of education that values common knowledge or common sense to a richly and deeply trained mind. On the one hand political leaders will talk about the importance of math and science while on the other proposing budgets that do not add up and trying to silence the science with which they disagree. The other quote is from a book that is appreciated by a very select few (not because it is a book only a few are smart enough to appreciate but because only a few have a taste for this style of writing). It comes from Robert Burton’s Anatomy of Melancholy. Burton thought that educators as a group belonged the to the race of melancholics. He lived at a time where everyone was placed in one of four personality groups based on the ” four humours”, or the four fluids that flow through the human body that shape a person’s temperament. The ideal is to have all four fluids in balance, which in turn puts the mind and emotions in balance. But most have a fluid that dominates. 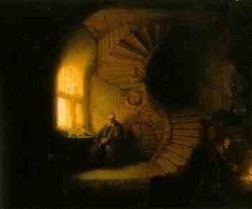 Melancholy was produced by the presence black bile in an unhealthy proportion to the other fluids, blood, phlegm, and yellow bile. Now you all are on your way to becoming medieval physicians. This captures the essence of what it means to be truly learned with a heart for scholarship. The scholastic temperament comes from within and cannot be given with degrees or diplomas. It is a frame of mind that does not use knowledge to gain advantages over others but delights in the acquiring and the preserving of it. Mr. Chips is probably everyone from my generation’s favorite teacher. After reading James Hilton’s novel Lost Horizons we we went on to read his other famous novel Goodbye Mr. Chips. He is a good teacher with a heart for developing the potential of all his students. In this scene he is working with a scholarship boy, that is, a boy from a poor family that could not afford to educate their children. Because of the academic potential seen in the boy he was given a scholarship that paid his way through school. But most of the students in the school come from wealthy families that could afford to pay for their children’s education. Because the scholarship boy came from a different social class from the rest of the students he was often ridiculed and his academic road was often brutal. I like Mr. Chips’ argument for getting an education in spite of the difficulties encountered along the way and think this should be a part of the academic make-up of all students (though it goes without saying that all students do not have this passion for learning). The book review section of The Guardian published a series of articles on the 1,000 Novels Everyone Must Read. This is a very diverse list taking into account most of the genres of popular fiction. The writers range from Danielle Steele and Ian Fleming to Leo Tolstoy and William Faulkner. There is something for everyone. I would like to propose an addendum to the list of books about scholars and scholarship. These are books that put academics at the center of the story and celebrates their quirks, eccentricities, and humanity. This is not an exhaustive list, just my list. A Canticle for Leibowitz – Walter M. Miller, Jr.
Well this is enough to get you started. The list includes science fiction, detective, and coming of age type novels. But at the heart of each of them is an academic setting and an attitude toward learning that colors the story. The life of the true scholar is characterized by a passion for learning, she or he trains the mind to satisfy the heart. I think it is very difficult to capture the attention of students, no matter what level of school they are at. In fact, I’ve never seen a teacher in my almost 13 years of experience that had the ability to capture EVERYONE’S attention. Obviously some people are better at it than others, but that is definitively one of the most import factors in a good teacher (that being a good teacher as someone you learn the most from). I would argue that very often a teacher with less intellectual ability will have their students retain more of the information than a teacher with no ability to interest anyone. I also believe it must be harder by a factor of at least ten to teach in a highschool rather than a college. In college, students begin to specify their course of study, so they in theory should be more interested in their classes. This provides a much easier path for the teacher in college, also if a student is not following through due to a lack of interest, its not the professor’s job to save them. This interest is the reason that college is where you are supposed to “find yourself.” You quickly can see if you are truly interested in the topic you are dwelling in, and if not, move on to the next. I think the reason that most teachers have difficulties getting the attention of their students is because of the fact that they are teachers. People have a mentality that tells them they do not want to sit there and listen while some boring person they don’t know talks to them about things they couldn’t care less about for an hour and a half. I think the best teachers are not teachers, but people. There are teachers who are very by the book and seem like they are there for no purpose than to convey the information they are required to in an efficient not always interesting way. However, teachers tend to not only garner more attention, but also tend to be more appreciated by students when they are people. That meaning that they talk to students, not at the students. They act as if they are in the presence of friends and will not hesitate to go off-topic a little bit, talk about themselves, or join in the fun once in a while. If someone feels they can trust, relate to, and enjoy being in the company of a teacher they will be more apt to listen and pay attention to the teacher and maybe even get actively involved in the lesson. Wisdom comes from experience not from a book. You can have straight As and still be oblivious to the world around you. I happen to agree with the fact that its hard for teachers to teach students because most are not interested in what they have to say. The teacher could make it interesting and the student should try to appreciate what the teacher is trying to say. However, thats not how it works. Each student should fully appreciate all subjects to be a well rounded person and educated person. At times learning may not be fun but you must obtain more and more information to make it in this world. If someone were to ask if I’d rather have common sense or an education I’d honestly have trouble deciding. Common sense is important but is it worth being stuck in the same spot for the rest of your life? An education is extremely important considering the fact that if you dont have one you cant be guaranteed a good future for you and your family. A well rounded education, in my mind, is the key to a good education. To only focus on lessons and ideas that are interesting to one self rules out any possibility of change of interest. It also rules out, in my mind, the possibility of being the best at whatever future endeavors a student tries to accomplish. Young adults change their minds a lot and if a student has only focused on one subject it means that they have no education of any other topic. If they ever change their mind as to what they want to pursue in further education or employment they will not be prepared. Also, if a student has only focused on one subject because that is the only thing that interests them, they will not completely master that subject. If a student is only interested in science and does not try to understand math then they will not understand science when math is needed in calculations and experiments. I also see no fault in scholarships rather then education being paid for by one’s family. College education is very expensive today, it is foolish not to take advantage of every resource available to pay for education. If a student receives a scholarship that should not be seen as a marker of poverty, but rather a marker of intelligence. The student from “Goodbye Mr. Chips” was proved to be intelligent when he received a scholarship, intelligence does not only go towards the wealthy. The clip with Mr. Chips interacting with one of his students is inspiring. Mr. Chips has the qualities I think all teachers would like to have. The student, too, possesses qualities that teachers wish all students would have. My first year of teaching has seen students with little or no enthusiasm to those who are curious to distraction. I have learned over the past five months the personalities, likes, dislikes and ups and downs of my students. I have enjoyed this process as it has helped me see my students as individuals rather than a sea of faces. Pulling this one aside for this reason and that one aside for another; knowing when to ignore temporary lapses in judgment in the classroom and when to take action has taken time- for me anyway. Things I am sure a seasoned teacher pick up on by the end of September. I have a ways to go, I know. But it is a journey I have enjoyed very much. It is not like anything I have ever done or experienced before. I look forward to working with my students for the rest of this year and want to continue to grow and become the best teacher that I can be. I do not think this ever becomes easy. Every student is a unique individual. There are things we learn along the way that help, but in the end each student has to be taken on her or his own terms. It is my experience, though, that there is an immense amount of good will on the part of students toward their teachers. This does not mean of course that they will always be enthusiastic about what we do. Yes, often times you need an education to make something out of your life. But I do agree that teachers have a very difficult time holding the attention of thier students. No matter what the topic, teachers will never be able to captivate every single student in their class. This may becasue of a lack of interest in the subject or the student’s unwillingness to learn. It is so hard to please eveyone because we alll like different thngs. However, although we may not like something that does not give the student a right to ignore the topic and not listen. It is improtant to be well rounded and face something even if it does not appeal to you. I feel that students would be more interested in learning if their teachers took a different approach to teaching. Today many teachers speak right from their textbooks. I will admit this gets dull listening to the same droning voice for an hour each day. Maybe if the teacher was able to relate the subject to something in the students life they would participate and have interest. I completely feel that the majority of teachers have a tough time capturing the attention of their students. Even if a teacher is able to get the attention of their students most of the time their is at least one student who will remain uninterested. I also feel that it is near impossible to have an entire class captivated by a lesson because not everyone is as passionate about certain subjects. I believe that a person must be truly gifted to be a good teacher. It is one thing to get in front of a class and lecture but it is another to have your students memorized by what you have taught them. Lastly I feel that the majority of students have it in their mind that all teachers are the same, in that they are boring. Some could argue that this is true because those who are not good at teaching for the most part come off as boring. I feel that if students put this idea aside then they might just find that their teachers do have some interesting points. I agree that if a person is not good at teaching they will probably bore their students. But I think the problem may go a bit deeper. Not even the best teacher can be exciting all the time. There are 180 days in a school year and even the best teacher is probably going to be off for at least half of them. It is best if the student brings an interest for the material to the class, but as you point out, not everyone is interested in the same things. At least, that would be the melancholic’s view. There seems to be another prevalent model in education, not Milton’s Il Penseroso, but L’Allegro. To engage with the resistant mind, the teacher now needs to be a stand-up comedian, fully accepting the need to sweeten the pill of education. Much of the problem with education can be seen in the current polarised debate on therapeutic education. On one side, those who believe that teaching is child-centred and focused on the emotional needs of pupils: communication is something to be prized. Education is lessons for life and common sense. On the other side, those who believe that teaching is about knowledge: what matters is the passing of hard content with little regard for the pupil. Both, are of course, misguided. The fundamental problem is that we have an education system that is built on “banking” and “testing”. We have lost the notion that education is transgressive and personal. I enjoyed your quote from Peacock, what a lost master! I agree that the teacher needs to be part stand up comedian. The advantage the comedian has is that she or he only needs to come up with one routine a year to make a good career. There are 180 days in the typical school year and each day needs it own routine. I also try to sing to my students on occasion. I am a huge fan of Mr. Peacock.